Terrible idea. The simple fact that they have used geo-location blocks on content, either by their decision or that of the content provider, only opens up more option to pirate, not pay. It's really very simple for the media companies. If it works, it's capitalism. If it fails, it's because of piracy and we need new laws to make sure it works. If it fails, its because of piracy. If it is successful, it would have been more successful if it weren't for those thrice damned pirates! Either way, we need more copyright! Eh, we both know it won't succeed. If it looks successful, the media companies will pull their content and try to create their own service so they can get all of the revenue. They are just letting Youtube do the market research for them. So when is Google gonna make a deal that's going to up my cap on the amount of internet I can react with? I'm sure not gonna pay twice for a single ability. They can keep their walled garden and pay for content. Somehow I've managed to truck right along without it all these years. I doubt that is gonna change just because they put up a paywall. Bob might like it though. The very notion that free stuff is going away is silly. Free is an amazing way to direct people to your paid content. There's also the freemium concept. And honestly why a single business model has to be the definitive answer? Why can't you mix more than one? Also, the model is already a success for Youtube itself. The customers are already there, the ad revenue is already being generated. It'll be just an extra cherry topping that will get some extra in for Youtube. The question is if the paywall option will be a success to the owners of those paid channels. As for those already yelling that paywalls = more money just ask for numbers and proper evidence. Even the apparent successes may actually be failures: what if by maintaining a free model you'd have 2, 2 times the eyeballs and you could be making much, much more than with your paywall? Speaking of which, do we have any study comparing similar businesses that went paid/remained free for comparison? You may be opening doors with me if you said there are some costs required for the storage of data. For example, Dropbox, MediaFire, MegaUpload, etc all have fees of their own; specifically for the speed of downloads and for the uploading of large files. There has to be money involved somewhere for hosting servers. That I think is legitimate. But what I cannot see being sensible is trying to use these costs to guard the IP solely. That is quite different from the storage of data. If what you say is true, that paywalls are inevitable for one reason or another, you have still said nothing about how to stop the piracy of the internet. "And paywalls do stop theft." I'll bite. How? When? For the sake of argument, let's agree that copyright infringement = theft (which I don't agree with at all, but let's roll with it). Can you point to ONE single example of a paywall that succeeded in stopping theft? The discouraging is being done by the RIAA and MPAA. I will not pay to go on youtube.If it ever comes down to that then I will be gone.And the Content I have for Free on youtube is all Mirrored since I host it myself on my Web Domain. I will never charge others for my Art.And I will never pay for youtube !!! Sharing is Caring ! Everything is Free at my Domain ! Mike is criticizing the implementation of paywalls as he has been doing for a while. Is Google flopping? I don't think so. And they maintained Youtube even though it produced only losses for years. Now it is profitable by itself. So no, Youtube is going well. Is it going to flop on this paywall? Not really, Youtube does not depend on this project. Will the channels flop? Probably quite a few. As for the last attack it's laughable. There's no winner or loser in that discussion. There is a lot of bs flying (as in saying that paywalls mean more money without any evidence supporting it) but only future will tell how it'll play out before any conclusions can be drawn. Many paywalls flopped already proving Mike's point, some survived (also proving Mike's point since he never said paywalls are all bad but rather they should be carefully implemented). Your point? You must be an absolute hit in moon landing denial discussion groups. Bob, as always: you have no idea what a paywall is. Do you write the stupid that comes out of your mouth yourself, or do you work off of an outline provided by your employers? Either way, I'm guessing you get paid pretty well. Unfortunately, the vast majority of your rhetoric rarely has much to do with the discussions at hand. Even a dissenting voice can be useful if it actually has something to do with the topic of discussion. I'd suggest you try it sometime, but that would mean you'd actually have to know what the hell your talking about. yes, I too was curious as what Masnick's performance would be like, having to 'think on his feet' and respond to real live questions. His performance, could only be rated as 'poor' to horrible. Did he address the issues, no.. Did he manage to articulate an alternative opinion... no..
Did he mindlessly repeat his usual mantra and hope for the best.. YES..
was masnick the token 'kook' that they get to present the 'stupid' side of the argument, and flatly deny reality?? Did Masnick manage to provide any form of convincing argument to support his 'opinion' ... NO. But you did manage to show that you are a pasty faced, stupid looking comb over guy, who clearly does not get out much.. .. you know. in the real world..
Masnick, you need to watch that video 100 times, and get an understanding of how massively outclassed you were, and how out of your depth, and detached from reality you have become. "ARE you just "playing a role", Mike? When you use that phrase instead of "I was", readers can ONLY take you literally. -- And I do." No, you're the only one around here stupid enough to take an obviously humorous phrase literally. I can't get the embedded video to play. Is there a copy on YouTube? It's on the "Stuff We Really Don't Want You To See" channel. The subscription price is only a mere $10,000/month. I've been using Youtube since it's inception eight years ago. For all that time, it's been free. Now, they want me to pay? Sorry, but Youtube, you've trained me too well to like the free content. "It's a pretty simple equation: if you, say, get 10 subscribers for $2/month, that's $20/month. That's not that much money. If you can make more than that in advertising, then you're better off advertising." And if you can sell those 10 subscriber's eyeballs looking at the screen to 100 advertisers over the course of that month, advertising will always make more. People will subscribe to a channel as a one off. If they pay for a month of a show they will watch all of that show that the channel as to offer and then drop it and move to a different channel. This decision may be partially based off the claims that people want Ala-cart pricing on cable. The truth is if cable allowed that then hundreds of channels would not be supported. As much as I dislike advertising, the drive of advertisers to push their product to people will always be stronger than the desire of individuals to part with their hard earned income. Advertising works to pay for content delivery because of this. I don't know if it always will, but I don't see subscriptions being the replacement. If they were crazy eyed Glenn Beck would be happy to be on the Internet only, instead of trying to get cable and satellite carriers to pick up his ... umm content. I might pay for an ads-free experience but that's a big might. My youtube usage is not that high. Yes. What I generally won't do is pay money for something that also gives me ads. There are exceptions. Sometimes I'll buy an issue of a magazine that interests me, or a newspaper, for example. Cable TV, however, is not such an exception. I don't go that road, regardless of whether the "cable TV" is actually cable, or is YouTube or whoever. If Netflix started showing ads, I would absolutely cancel my subscription. It will fail like the last time. There's plenty of free content on youtube. I mean people like Psy made a fortune on a video anyone can watch. Honestly though these pay for channels had better have really good content. Why should I watch Eric Striffler for $1.99 when I could watch smosh, ect for complely free. 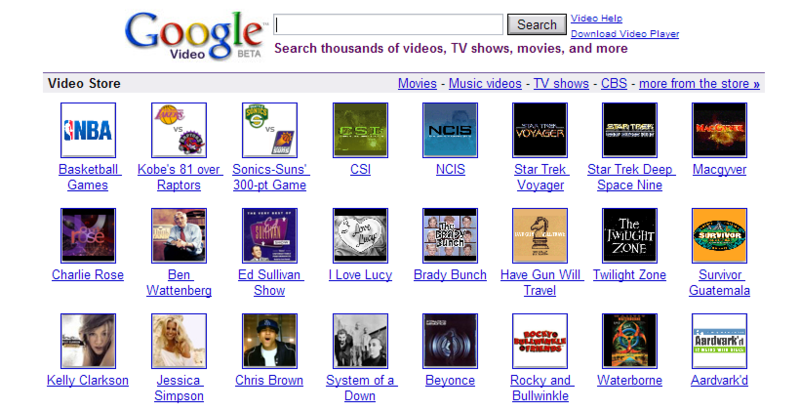 Even without youtube there's plenty of video sites with stuff people care. Mike you deserve a medal for that performance, if that was me i would three stooges slap that whole group. I was shocked by the answers that were given and left me with the impression that they were clueless or just paid shills. The ideal that we need to be trained to pay for content is offensive. We already pay for content two to three times over. First Google. Then BitTorrent. Paywalls everywhere! TechDirt will be the last to see the light. Click report after me, Bob's just too dumb to be read. No, but it is likely that at least 98 out of 100 surf away again, while 1 percent are trying to cheat their way around the wall. A small fraction of the rest will like what they think they see and subscribe. They need a lot a advertisement to turn even 5 % from free users to paying users. From their standpoint, any money earned through a pay system is a plus and bonus to the bottom line. If they're showing ads to the payers, yes. If not then any time they spend on the site viewing premium content is time lost to advertising. the media companies don't seem to care as much about their bottom line as they do just trying to extract money from consumers. I guess it's to get back at people for pirating. they'll leave dollars on the table to go after pennies from the pauper's pocket. Someone should file a protest against this program and get the guy who came up with this idea to shut it down. What exactly is this paywall for? To let the viewers share the development costs with more than just their eyeballs. It lets them pay real money to support the artists instead of just watching another dumb ad. It's better in every way. Says the moron that likes his world bathed in annoying ads. 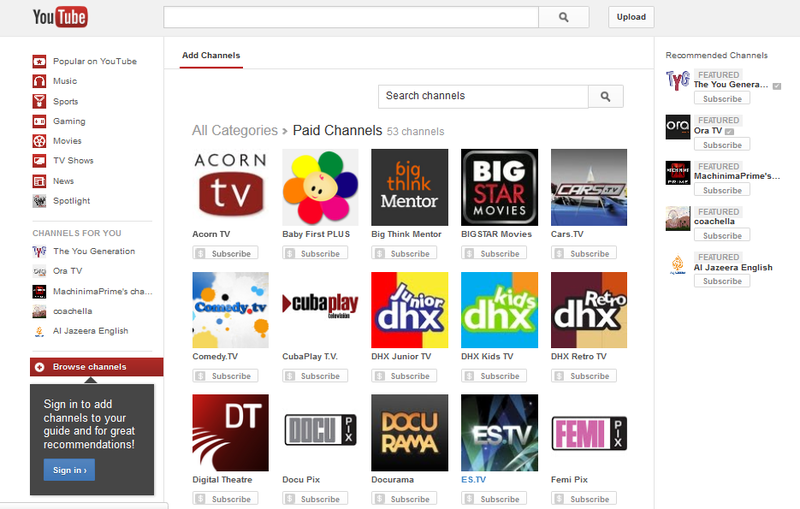 I think YouTube is hoping ultimately to replace cable. It is already into broadband. YouTube seems to want to expand beyond user-generated content available for free. If paying studios for original content hasn't been working to everyone's satisfaction, then finding a way to compensate places with a deep library of already created content was probably the next step. Will it work? I don't know, but if YouTube is targeting cable TV, then it already has a model that has worked and the company may feel it is worth trying yet again. "I think YouTube is hoping ultimately to replace cable"
That's a very dangerous game and one that they might win short term but will lose quickly. If lets say CBS decides to put up a YouTube channel(s) and charge X amount per month for it how long before they start demanding more money or just say F.U. and start their own system run which they have full control of? "One thing YouTube has to do is to prove to "content creators" that it can compensate them better than other options." This whole content creator thing strikes a raw never in me. You mean content "distributors", "licenc�", "litigator's" "conglomerates"
Many real content creators are making money on YouTube already or just using YouTube as a jumping point to many other things. Not as much as people think, which is why they are looking elsewhere. YouTube can be helpful launching careers, but once that visibility is there, many look beyond YouTube for money. I could pull quite a few articles quoting YouTube stars who say their ad payouts aren't as big as people think. I've saved every article on the subject that I see. Here's one that might be a good overview. I honestly don't care what YouTube does, but for whatever its reason, it wants to move beyond what it is currently doing. Apparently in YouTube's mind, this is worth a try. Jesus, either get some Rogaine or lose the front comb-over Baldy. Oh, some occasional sunlight might be something to consider. and the first words out of Mick the nick's mouth ?? We'll call him from now on "articulate Mick". A word of advice, next time you are asked to do something, where you have to think on your feet, and are required to give something more than your mantra.... DON'T. You ability to express yourself in person is limited. and yea, lose the comb over, and get some sun !!!! So... why isn't this HuffPost video behind a paywall? Mr Hosein has convinced me that I don't want to pay the University of Washington for the privilege of attending his Digital Media Program, I cannot understand why anyone would hire Dan Safkow as a "video marketing strategist", and that short clip of "Pretty Much It" makes me wish that they would move their show behind the paywall so that I wouldn't run the risk of seeing any more of it by accident. So, nothing works, except of course, the ones that DO work (but lets not dwell on those shall we). Why bring up the Newspaper side ?? is this not a conversation about video streaming ?? in the video world as you have provided examples, it's been 'debunked' that they DO NOT work.. So if it is not true, if no one pays, you are saying it IS true if people do pay..
As opposed to your huge assumption: that people will not subscribe. would you like some examples where people DO subscribe ?? starting with TechDirt ? No, it's downright STUPID, probably why your the only one saying it. I am sure, even you Masnick are aware that is NOT the ONLY REAL BUSINESS MODEL.. But, those work because of different factors: mainly a combination of convenience and a ton of content all together. so you are saying that Google Youtube is not able to combine convenience and content ? Why would you say such a stupid thing Masnick ? Oh, Google wont work where Netflix and Spotify do work because they do things very slightly differently ?? than when you expect Google will do, or progress towards ? People are paying for those because of the completeness of the offering. Here, people are being asked to spend between $1 and $10 per month for a single channel of content. Masnick, you are the last person on earth I would ask for advice on people's spending habits and reasons. People will pay for things they want, does not matter if it is 1 channel or a million channels, if that channel has things they are willing to pay for, they will pay for it. Just like with Netflix and Spotify et al. yet, they were upheld time and again on the video side. So comparing video streaming to Newspapers is a SILLY argument, raised by Masnick. We also know it is not necessarily FALSE !!!! Here, people are being asked to spend between $1 and $10 per month for a single channel of content. It may work for a few specialized shows: Game of Thrones? Yeah, sure. But not many others. Pure supposition on your part there masnick. how do you know, that's right you DONT.. you are making as many assumptions (and ignoring the glaring examples of where it does work) as anyone else.. probably more so. role playing now ?? even wondered why you are the LONE dissenter. I guess you thought Netflix and Spotify were "dumb idea's" too right ?? Or that it was a dumb idea to introduce your own form of paywall and pay for content, perks that you have introduced here on TechDirt ?? Run many successful businesses have you Maskick ?? been an actual player ?? Oh, you talk a lot about what everyone else is doing, making a small living of your tiny backwater hate site. But what have you done ?? why would anything take your advice, have you a track record with these things?? If you do you have never displayed it here. Do you have detailed information about this business model, or it's future plans, if so why did you not relate them, if not why talk about it as if you are aware of their plans and it's model ? Do you think Netflix's model is exactly the same as it was on the day it started ? do you think companies are not able to adapt and evolve, try different things and determine what works and what does not ? DO you think you have some great 'insider knowledge' and 'finger on the pulse of the world' that gives you power to determine what will or will not work, without even really knowing what it is exactly ? Probably the reason you are the lone dissenter is your arguments are just stupid, and proven so by the many examples of you being dead wrong once again. Or your desire to say "it does not work for newpapers, so could not work for video". As you know, there are many examples of both models working as expected, and well. who was saying that "the only real model" is a direct pay type ?? clearly there are as many models as people or companies decide to implement, there are many successful models, some direct pay, some not. so who said that, "people" ?? what people. It may work for a few specialized shows: Game of Thrones? Yeah, sure. But not many others. That assumption is based on what facts again ?? oh, that is just what you think, an assumption if you will, a guess from someone with extensive experience in the industry.. oh wait.. with no experience in the industry..
Sold many Crystal Balls recently Mick ? How can you scream at mike for having the audacity to compare video streaming to newspapers BECAUSE THEY ARENT THE SAME, while repeatedly comparing video streaming to music streaming, which aren't the same thing? Sir, stop moving towards the lunatic wielding solar panels, and back away real slow-like. Or you'll catch it! I hear it's contagious! 2. It's not about money I just don't want you to have my personal information and or credit card #. 3. Information is free and trying to control it is like trying to stop a fire hose with a wine cork. But probably the most important, at least for me; I didn't even know what a paywall was because I surf the internet via proxy, vpn, firefox without history tracking, or any tracking for that matter, so I have never seen a paywall since they all seems to work via tracking cookies which I don't collect. There are no results found for this word. If you tag a video with it and the video shows up by itself, don't be surprised because you just coded YouTube for that word. Now make it cost 5.95 to watch. Then run your new wild and crazy commercial telling everyone its there in any city. The will crush the paywall once that word you created (it can be a hash-tag folks) finds one result in one city from hundreds of thousands of people sitting back with popcorn to watch it right then and right there at seven thirty or whenever you tell them to watch it. they don't need trailers anymore, ask redbox. Don't tell Netflix is on tv too. Or amazon for that matter, but you might want to tell anyone heading to the film festival about YouTube's local reach through configuration at least. Jeez.